Beeswax. If you're a bee, it's an important part of the structure of your hive. If you're a human, it makes a great scented candle material. This smooth-burning wax produces delightful mildly aromatic candles that that some find preferable to classic tapers (which, by the way, have some surprising uses of their own). 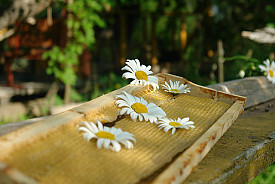 But beeswax is useful for much more than candles, and it's time you started expanding your uses for it around the home. Before you use beeswax, some tips. Organic beeswax is free from chemicals that might interfere with the chemical composition of the wax, cause it to perform strangely, or make it dangerous to use in food items or on objects that will be used around food. Beeswax can also vary in quality, so you should inspect it visually for signs of contaminants that might affect performance. If you know your provider, so much the better -- you can ask about anything that might be present in the wax. Like other forms of wax, beeswax is excellent for lubricating sticky drawers, stuck fasteners like bolts, and more. Rub the wax in to distribute it, ensuring that the stuck item will glide instead of getting hung up with friction. Try it on furniture joints, hardware, and anything that's squeaking, sticking, or otherwise being obstinate. If you're working with a sticky drawer or other wooden product, use a small rag to apply the beeswax if you're worried about splinters. Beeswax makes a fantastic wood conditioner. Unlike regular wax, you can use it on wood items around the kitchen like cutting boards, as long as you use food-grade (organic) wax. Try warming beeswax and mineral oil and rubbing the mixture into butcher block counters and cutting boards to keep them in good condition, reducing cracking and other problems. Mix a quart of turpentine with a third of a pound of beeswax to create a mixture you can buff into bronze and other metals for a hard, smooth, shiny finish. In addition to making the metal look much more handsome, the coat will protect it from oxidation, so it won't cloud, turn green, or develop pitting. Use a similar mix to condition tools to prevent rust. You can also preserve a patina with a coating of beeswax, if you like the look of greening copper and other metals that develop handsome colorations as a result of oxidation. For patina preservation, use straight beeswax, with no turpentine. Want to give your concrete countertops a muted, sophisticated, polished look? Rub warmed beeswax in, allow it to dry, and then wipe down to remove any excess. The polish will also help prevent staining, as it will provide additional sealing for the concrete. Have you ever looked up at the exposed beams of a structure and admired their waxed look? You can use a 1:1:1 mixture of linseed oil, turpentine (or mineral oil), and beeswax to create a waxing solution for wood that isn't going to be worn by use or exposure. The wax seals the wood and gives it a rich luster. Professional carpenters often use this technique for wood finishing. You can make poured or dipped beeswax candles from beeswax blocks, available from a variety of craft and home stores. You can also buy beeswax sheets and roll them into tapers. These candles make great ambient mood lighting and fantastic gifts, too! Rub beeswax blocks onto outerwear for a quick waterproofing. Or rub and buff in melted beeswax for deeper penetration and more water resistance. People have been using this particular beeswax trick for thousands of years, so why not join in? No, you can't wrap beeswax around your food. But you can treat cloth with beeswax and use it like plastic wrap to protect food once it's opened, and your waxed cloths will be reusable. Ditch the plastic in your kitchen! Here's an excellent tutorial on making waxed cloths for wrapping food.